الخيار الأفضل للحصول على المتعة والاسترخاء, فندق راديسون بلو سيدني يقع في منطقة Sydney CBD في سيدني. يسهل الوصول إلى هذا الفندق ذو 5 نجوم من المطار، فهو يبعد عنه مسافة 8.Km فقط. يشكل هذا الفندق ملاذاَ مريحاً للاسترخاء ويمنح زواره فرصة للاستجمام والتجدد، وهو يقع على بعد خطوات من المعالم السياحية الكثيرة للمدينة كمثل: ‪Dobell Memorial Sculpture‬, اوستراليا سكوير, ‪Opal Discovery Centre‬. إن الخدمات الممتازة وحسن الضيافة العالي في فندق راديسون بلو سيدني تجعل إقامتك تجربة لا تنسى. يمكن الاستمتاع بمجموعة من الخدمات على أعلى المستويات في الفندق كمثل خدمة الغرف على مدار الساعة, واي فاي مجاني في جميع الغرف, خدمة التنظيف يوميًا, مجهز لذوي الإحتياجات الخاصة, مكتب الاستقبال على مدار الساعة. تنعكس أجواء فندق راديسون بلو سيدني في غرف الضيوف.تلفزيون بشاشة مسطحة, هاتف في الحمام, مرآة, ميزان, عدة خياطة هي بعض الميزات الموجود في العديد من الغرف. يقدم الفندق مجموعة واسعة من وسائل الراحة المتنوعة، كمثل: حوض استحمام ساخن, مركز للياقة البدنية, حمام سباحة داخلي, سبا, تدليك. استمتع بخدمات لا يعلى عليها وعنوان ذو اعتبار في فندق راديسون بلو سيدني . سيُطبق رسم إضافي بقيمة 1.5.% على جميع معاملات البطاقة الائتمانية وبطاقة مدين. يرجى ملاحظة أن الفندق يفخر بالالتزام بمعايير Green Globe Silver. I went to the hotel earlier than the check in time, I left my bag in the hotel and came back. Once I checked in and get in to the room, my bag has already carried to the room. I am so impressed of the service. The bed was very comfortable with selection of pillow. Nice breakfast. La camera è molto grande con le volte alte, il letto comodo. Il bagno ha sia la vasca che la doccia in più, almeno nella mia stanza, una persiana che si apre su un vetro sulla stanza. La colazione abbondante e varia. Si ha la possibilità di fare il check out gratuito in ritardo in base alla disponibilità. Hotel staff are professional, but friendly. Deluxe rooms are large for inner-city hotel rooms - spacious and very comfortable though desk chair is unsuitable for in-room dining. Coffee plunger is provided but ground coffee comes at a cost. Great location, clean and enjoyable. If you can get a good weekend price it is well worth it. Everything is just a stone’s throw away from the hotel. The location is spot on. You can go to the mall, you can go to Sydney Opera House, you can just walk around. Everything is at your fingertips. Would definitely stay here again, no doubt about that! first time in SYD and arrived in the very early morning. Although I couldn't get a room but the staff arranged a gym access for me at least to take a shower and got changed. Room was very clean and tide and I liked the bathtub that I could relax before going to bed. A location was excellent , walking distance to Darling harbour, QVB and even to harbour bridge and Opera house. The building itself looks historical antic exterior which is another benefit that I felt that I was staying in a special place. Radisson Blu Sydney Hotel's location is within Sydney's business district. There are nice restaurants nearby with delicious offerings. Their rooms are very clean and spacious. Bathroom has a separate shower and bath. We would like to thank the manager Mr. Peter Tudehope for making our stay highly satisfying and very memorable. We sincerely appreciate your hospitality! Our thanks also to the on-duty manager, Mr. Ritesh, for making our stay as comfortable as possible. Kudos to the leadership of Mr. Tudehope for pooling a great Radisson Blu Sydney team always committed to providing their guests the kind of service they deserve and even exceeding guests' expectations. Two thumbs up!!! While my hotel stay was comfortable and the hotel's location meant I could walk everywhere, it didn't show me a WOW factor. 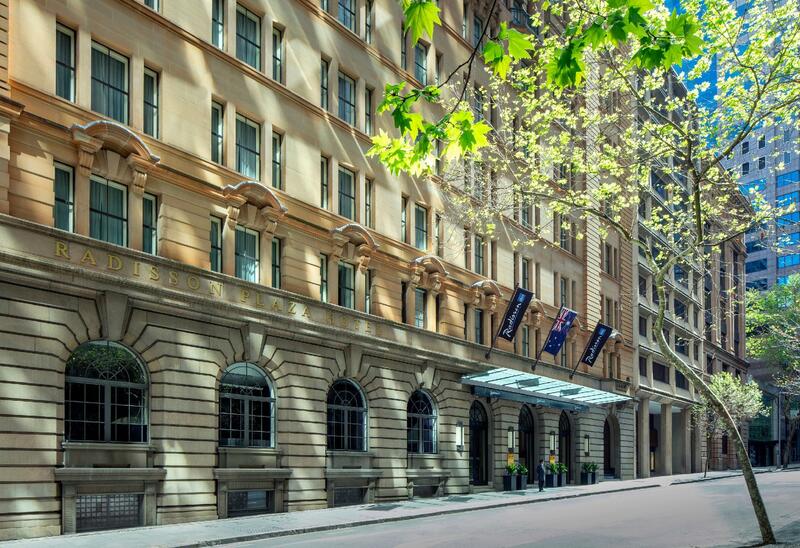 It can't compete against other 5-stay properties Sydney like the Park Hyatt, Shangri La or the Four Seasons. The levels of service don't compare, even though the Radisson's staff are warm and approachable. Rooms aren't furnished extravagantly but are perfectly comfortable. It is a great business hotel and that's clearly its intended market. My partner and I went to Radisson for a weekend and felt so pampered and relaxed. The staff were super attentive, helpful, and were all smiles. The pillow menu and comfy bed helped us feel well rested. The hotel even gave us a complimentary bottle of sparking to help us celebrate our special occasion. Breakfast at Lady Fairfax was fresh and the variety of food on offer was amazing. The crew at Radisson truly did a stellar job. The hotel is located in the heart of the CBD area..close to everywhere ..really clean and superb customer service ..I was looking for a toilet bowl for my little one and can’t believe the concierge actually tried his best to look for places that may sell them ...I would defiantly recommend to ppl who is looking for a convinient hotel that is walking distance to most attractions ..
A great hotel. Bed very comfortable. Plenty of hot water for the shower. My wife liked it...that's a big PLUS! The Radisson Blu Hotel turned out to be ideal for our needs. The hotel is lovely, well staffed and is in a great location. 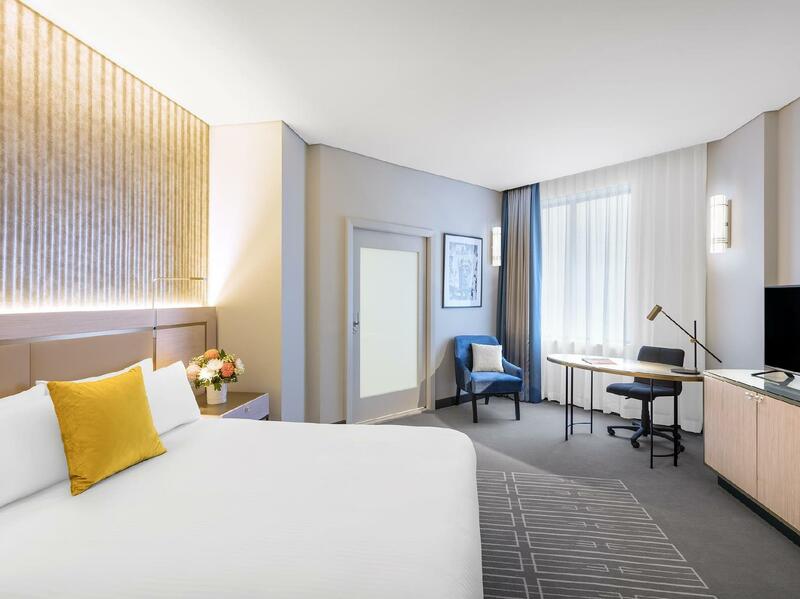 The Radisson blu is close to Wynyard Station, Circular Quay and an easy stroll to the main shopping areas and sights of Sydney CBD. Prices for a harbour view hotel in Sydney are huge and more than we wanted to pay so we opted for the Radisson Blue. A great location just five minutes walk from Circular Quay or Darling Harbour. George Street shopping is just one block away. I can't think of a better location for a first-time visitor to Sydney. The Radisson was an easy 10 min walk to the Rocks, Botanical Gardens, and 15-20 min walk to Darlington Harbour. The young doormen always were friendly and attentive. Our room was gorgeous with great features and large. I asked for a quiet room and our room was exceptionally quiet although the view was overlooking a torn down building across the street. The only thing I would change in the room would be the bathroom. It has a frosted glass door and the light is turned on from outside the bathroom making it hard not to disturb others in the room at night. Actually I couldn't see all facilities I only slept & had to left early morning for work. My room was very clean and quite. I am very sensitive to sleep so it was very important. Mostly I came back to hotel lately but it was ok to go around alone. We stayed a night for a mini getaway and everything was amazing. Staff were exceptional, room was lovely and bed was actually comfortable! We enjoyed a drink in the bar and it had a great relaxing atmosphere. Only slightly disappointing was buffet breakfast. Quality could have been better for a hotel like this. We did enjoy nonetheless. Overall, we loved our stay and will be back. Spent a weekend at the hotel for a Weekend escape from country life its central location and access to transport is perfect for accessing all Sydney has to offer. Quiet on the weekend by day but livens up at night lots to see. Walking distance to all of central Sydney perfect for any traveler. Friendly Staff and perfect facilities very comfortable for any length of stay would stay again. I had a booking issue and the hotel cost more than I was expecting and well over my budget but there was no disappointment with the hotel in any way. Mohammed from Laundry Services delivered outstanding service. We were a little lost (entered through rear rather than main entrance), and instead of giving us directions, he offered to carry our luggage and personally took us to reception. I asked a quick question about the Bentley restaurant whilst in the elevator, and instead of telling us to call, he went over to the restaurant and made an enquiry on our behalf then came back and gave us the answer we were looking for. 10/10 for service from this gentlemen. Both my husband and I were truly happy with his and the other staffs' service provided. The hotel itself was beautiful too. The only downfall was that we didn't have a very good view. All we could see were office buildings, but I guess that should have been expected. Also, a bit pricey but then again it is a 5 star hotel. Thanks Radisson, we look forward to staying again in the future.